Acrylic Coating Deflects Sunlight to Increase Building Energy Efficiency. Your roof represents a long term investment in safety and energy efficiency for your company building. Unfortunately, time and the elements can be hard on your rooftop. A little wear and tear can turn into major damage and repair costs. Thankfully, roof coatings can extend the life of your business rooftop and enhance its protection capabilities. Here are 3 interesting ways your business could benefit from roof coatings. Businesses with flat rooftops are particularly vulnerable to this danger. When rain pours onto your roof and it can’t find a place drain, this water start to corrode your rooftop. Cracked materials allow water to drain into your business, damaging insulation and supporting mold growth. With a special waterproof coating (such as silicone), you can secure your roof from corrosion and internal water damages. Ultraviolet (UV) light doesn’t just damage your skin, it can endanger your rooftop as well. When a building absorbs large amounts of solar radiation every day, the roofing material weakens over time. Worse, UV radiation causes excess heat to accumulate inside your building and burden your HVAC system. In short, that means extra energy costs when you try to keep your building cool. With a ultraviolet reflecting roof coating, you can improve your building’s ability to deflect light (instead of absorbing it). White acrylics are particularly effective at this. If you’ve seen regular spikes in your energy consumption during heavy sunlight hours, it might be worth investigating a roof coating for your business. While it may not seem like a priority, keep your rooftop clean of debris prevents natural roof corrosion. Wind blown dirt and twigs like to scrape the paint off your roof and cling to the materials. This accelerates the chemical breakdown of your shingles, bitumen, etc. With a silicone or urethane coating, you could potentially extend the lifetime of your roof for years. 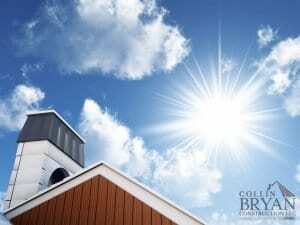 If you’d like more information about commercial roof coatings, talk to our crew at Collin Bryan Construction LLC. We’d love to answer all your questions at 214-927-5263. Posted in Uncategorized on April 18, 2018 by Collin Bryan. Once you’ve decided to create your very own outdoor patio, you are left with an endless amount of design, budget, and decor decisions. Having a plan from the beginning can help keep you from getting lost in the shuffle of the multiple tasks, choices, and research that is sure to follow. Outdoor Patios Can Provide a Comfortable, Relaxing Atmosphere Like No Other. Have a predetermined idea of what you want to spend, and how you want to use your patio. Will you use your area for relaxing with the family, or will it be used for hosting parties and get-togethers? 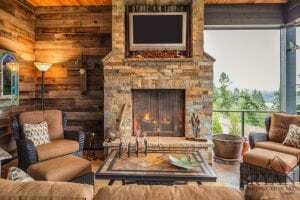 Will your area be decorated with palm trees and tropical flowers to portray a tropical theme, or will it be more of a living room outdoors with a fireplace and large screen TV? When planning your theme, keep your budget in mind. If you are looking for a minimal space, a few pavers paired with an elegant roofing system may be enough. However, if you’re looking for something a little more elaborate, consider a paved space with wooden trim and roofing to go along with a few tiki torches and tropical flowers. Once you have decided how you want your space to turn out, consider the labor that will be needed to complete the job. Will you need a slab to be poured? Will you need roof, bar, or furniture construction? 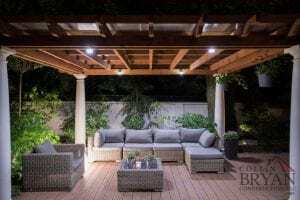 Consider the type of lighting you would like to use to compliment your patio, along with a cooling or fanning system if needed. Our construction experts can help you identify your construction needs along with budgetary constraints and timetables so you know exactly what to expect. Creating an outdoor patio can be exciting. Let the Collin Bryan Construction LLC experts provide the guidance and support you need to make your new space the best it can be. Call us today at 214-927-5263 to schedule your consultation. Posted in Uncategorized on March 16, 2018 by Collin Bryan. As a homeowner, there are many different things you need to keep in mind when it comes to your roof. Obviously, you want your roof to be in good condition, from the edges to the very top, and everything in between. Today we are going to talk about a component on the edge of your roof, known as the roofing fascia. We will go over what fascia is, and how you can recognize signs of damage on your fascia. The fascia is the part of your roof that protects the edges from wind and rain. It is also used as a place to secure your home’s rain gutters. Your Fascia Is A Key Element For Protecting Your Roof! A simple visual examination will uncover whether your fascia needs professional attention or replacement. If you know that your fascia is pretty old, then you should call for an expert inspection to assess how well it is performing. Peeling Paint: Paint that has started to peel will cause an unsightly problem that affects your house’s curb appeal. Peeling paint has no ability to defend your fascia wood from rot. Rotten fascia should get replaced, since it can no longer render its job effectively. At the bare minimum, a new paint job will deliver an instant facelift for your house. Water Damage: Spending years as a mount for your rain gutters can make fascia liable to water deterioration. This occurs most frequently when your gutters start to overflow onto the fascia, ceasing to perform the right way. Simple old age will also cause it to happen. The interior of your roofing will be susceptible to wear as water causes your fascia boards to bend and come loose. If you need fascia repair or fascia replacement, or any other residential roof services, give us a call today at 214-927-5263! Posted in Uncategorized on February 15, 2018 by Collin Bryan. When your roof has damage to it, it gives a straight line of danger into your home. Your roof is the main shield for your home and when water gets into it, it can cause serious damage. These are a few things to not only pay attention to but get fixed right away because a small leak will turn into a big leak if not properly taken care of. 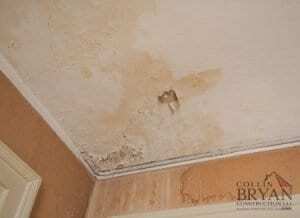 Don’t Get Caught with Brown Ceilings, Call Us Today to Fix Your Water Damage. Your safety- First and foremost, your safety is our number one concern, so when you have a leaky roof it is important to call someone out to your home right away. Water can leak through your roof and onto your electrical wires and could cause a fire without you even knowing it. Even scarier is if this happens while you are sleeping, or not home. Insulation- When your insulation gets wet, it stops working the way it is supposed to. It loses its effectiveness, and will actually make your energy bill increase because it won’t be able to keep the heat or cool air in or out. Insulation also takes a long time to dry and if too damaged, it will need to be replaced. Damage to the structure of your home- When water leak into your home it can get into the framing and rot your wood. This will cause a whole other set of expensive issues and can do major damage. It can also cause mold to begin growing in or on your walls which goes right back to the safety of you and your family. When you have a leaky roof and need help right away, our team of expert roofers at Collin Bryan Construction LLC are there for you and will do whatever it takes to get your roof and home back to perfect condition. If you ever have questions about roofing, give us a call at 214-927-5263 and we would be happy to help you. Posted in Uncategorized on January 10, 2018 by Collin Bryan. Remodelling a space in your home can be both exciting and overwhelming. From color choice to task options, every decision counts. Ensure you’re making the right ones with correct planning and careful considerations of these three remodeling tips. When planning your remodel, the most important consideration is your budget. This will help you in making every other decision. First, decide how what you want to spend on the entire project. Then, decide which areas of remodeling are most important to you, and where you want to spend the bulk of your budget. For instance, demolitions or additions will be much more expensive than simple flooring or paint changes. Once you have your budget and basic project ideas, you can begin building your design. This step is where you will decide the details of your remodel. Will your new kitchen bar have a stovetop or will it be a simple countertop design? If you are installing flooring, will it be carpet, tile, or hardwood? What color and texture would you like? Most of these decisions can be made loosely using any vendor catalog for ideas. Typically, this is where people begin to stumble. Color planning, however, can be a simple process if you follow the simple “rule of three” guidelines. First, choose your base color. This is usually a neutral color that will be used for the bulk of the project. Next, decide on one secondary color. This color will provide depth to your space as well as pop. The last color will be your accent color. This is typically a bright hue that accents the first two well. It will add dimension and focus to particular places in your space. Once you have chosen your three main colors, you can begin filling in your decor. Redecorating or remodeling can be a simple process if you follow the correct procedures. Our professionals can offer remodeling tips help guide you through the process of your remodel to ensure that you end up with your dream space. 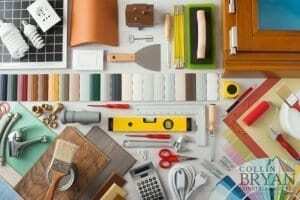 Call the Collin Bryan professionals at 214-927-5263 to discuss your remodel options, and begin your decorating adventure. Posted in Uncategorized on December 7, 2017 by Collin Bryan. A Clogged Gutter Can Lead to Serious Problems for Your Roof’s Drainage. Your roof represents a serious investment. It also provides a vital line of defense for your home or business. A roof that falls into disrepair will suddenly make you and your property vulnerable to water damage, cause an increase in your energy bill, and negatively affect your structure’s appearance. To take care of your roof, schedule regular inspections from a professional. In the meantime, you can practice a few pieces of roof maintenance yourself. 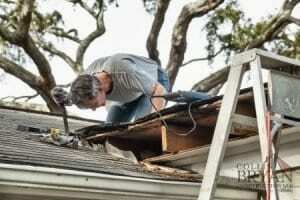 You should make a habit of cleaning your roof of debris after every storm. Limbs and other pieces of debris will hold moisture against your roof and lead to deterioration. Make sure to check behind all fixtures of your roof, including pipes, skylights, and chimneys. Flashing represents a weak point on practically every roof. These metal strips cover the seams at vulnerable areas of your roof. Check to make sure the flashing has not begun to separate or rust. You can also reseal old flashing with new caulk. 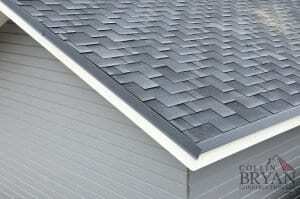 If you see loose shingles, you can affix them with a small amount of roofing cement. In the case of missing shingles, or an abundance of loose shingles, call for professional service. Lastly, make sure to maintain your gutters to protect your roof and home from rainfall. Clean them twice a year by removing all debris, leaves, twigs, and nests. At Collin Bryan, we represent your premier source for roof maintenance in Dallas, TX or anywhere in the state. To learn more or schedule service, call us today at 214-927-5263. Posted in Uncategorized on November 6, 2017 by Collin Bryan. When Do Homeowners Need to Get a Roof Inspection? There a Few Reasons to Get a Roof Inspection. If you’ve been a homeowner for years or you are a new homeowner, there are many aspects of your home you need to keep in good condition. One of the most important things you need to keep in excellent shape is your roof. In order to ensure your roof is always functioning properly, it is important to get yearly maintenance and inspections. While maintenance can happen every year, the question homeowners usually ask is, “When to get a roof inspection” for their home. Below are a few times you will need a roof inspection. One of the most common reasons to get a roof inspection is when you are buying a new home. You don’t want to move into your new house to discover the roof is over 20 years old and is leaking. With an inspection before move in, you can determine if anything is wrong with the roof. When you are selling your home, you want to make sure that the roof is in good condition. It can lower the value of your home and also there is the potential of losing an offer that was placed on the home. This is the best time to get a roof inspection so you know your roof will protect the new tenants. If your home has recently been damaged by a storm, there is a chance your roof could also be damaged, as well. By getting a roof inspection, a roofer can determine if you need repairs. 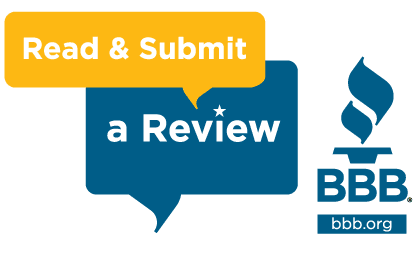 Whether you have roof leaks or you think something is on your roof that shouldn’t be, getting an inspection can fix these things, as well as improve the quality and longevity of your roofing system. Call Collin Bryan Construction today at 214-927-5263 for a roof inspection in Dallas, TX. Posted in Uncategorized on October 4, 2017 by Collin Bryan. Are you concerned that your roof may be due for a replacement? We rely on our roofs to protect our homes from the elements, so it can be frightening when they are in less than great shape. today, we will discuss a few key warning signs to look out for when you’re dealing with a failing roof. If your shingle roof is more than 20 years old, its a pretty fair guess to assume it might be due for replacement. Shingles are durable, but they don’t last forever. 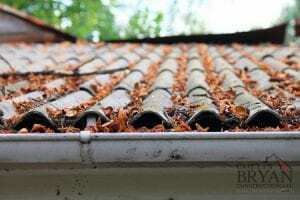 If they are not quite that old, but they are looking a little worse for wear, let our pros inspect your roof. You may be eligible for a roof restoration service instead! If you are noticing creeping water stains in more than one place on your ceiling or even your walls, you are look at multiple leaks. If your roof has multiple leaks at the same time, it may be time to get a new roof. Leaks can cause quite a lot of damage under the surface, particularly if they have made it all the way to your ceiling. If you notice that you have multiple cracked, curling, or even missing shingles, it is time to order a new roof. Gaps in your shingles almost promise a leak problem, and you should have the problem addressed immediately. For professional roof repair and replacement, give us a call today at 214-927-5263! Posted in Uncategorized on August 22, 2017 by Collin Bryan. Roof leaks can cause stains on your ceiling or along the tops of walls. Leaks large and small will wreak havoc on your home. While a drip from the ceiling provides a clear indicator, a leaky roof is not always so easy to detect. Stay attentive to the following signs, and call Collin Bryan Construction for service should you notice any of them. Don’t delay, as negligence in the treatment of leaks can lead to serious damage and costly repairs. 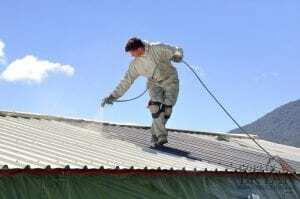 As water travels through your shingle roof, it becomes contaminated. When this tainted water reaches your ceiling, it will leave behind a brownish stain. If you notice one of these stains around your home on the ceiling or near the top of a wall, you probably have a roof leak. The flashing on a home should keep water out of your rafters. If flashing has decayed or become damaged, water can enter freely and cause leaks. The sign of this trouble appears on the exterior of your home, along the tops of the walls. If you notice any discoloration or water spots, call for an inspection. If you notice that your roof has lost some shingles, then you may have a water leak. If you catch the missing shingles early enough, you may prevent the leak from taking shape, however. Missing shingles allow an easy entryway for water into the roof, and should warrant fast repairs. Collin Bryan Construction offers full repair and inspection services for roof leaks. These leaks can create issues around your home, from encouraging the growth of mold to destabilizing your walls. If you suspect a leaky roof in Dallas, TX or around Dallas-Fort Worth, call us today at 214-927-5263. Posted in Uncategorized on July 19, 2017 by Collin Bryan.